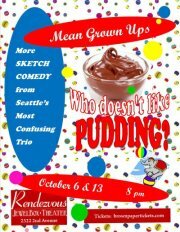 MEAN GROWN UPS presenting (who doesn’t like) PUDDING? I don’t think people realize what wonderful talent we were able to get for the movie. Mary did the voice-over of the poem written by another amazing artist. Frank and I went to Mary’s comedy show, MEAN GROWN UPS a couple of years ago, not knowing what to expect. Kind of like when Mary came to see the movie…Mary and I were both hoping that we weren’t going to have to be uncomfortable about not liking it. 😀 Fortunately for both of us, we were super glad to love each of the others work!!! I still reminisce about a certain leotard skit that I snorted through. Super great show and I highly recommend it! Frank and I will, of course, be there with bells on.